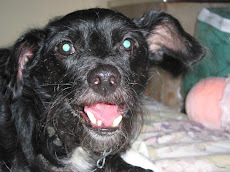 My dog says KitCat is taking over the blog today! 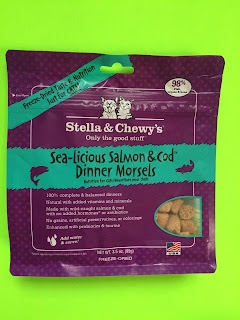 We love to try different freeze dried foods, so we were eager to check out Stella and Chewy's Sea-licious Salmon and Cod Grain-Free Freeze-Dried Cat food. Meow wow! 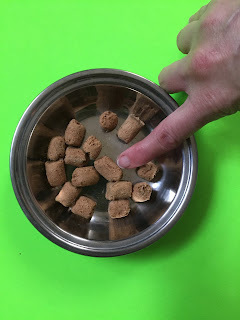 The first five ingredients in this particular recipe are salmon (ground with bone), cod (also ground with bone, cod liver oil, pumpkin seed, and potassium chloride. This food is made with sustainably-sourced ingredients and is 98% wild caught salmon and cod, organs, and bone. Lots of raw food nutrition. Freeze-dried foods need to be mixed with water to make a meal, but I used these nuggets as treats instead. Initially, I was concerned over the size; they looked too big for a cat. I thought I'd have to break each piece into two, but I was wrong. KitCat took each piece and was able to chew it or break it apart fine. If you give them as treats, be sure the water bowl is full. If you choose to mix it with water for a meal, the nuggets are a little easier to work with than the traditional powdery freeze-dried food. The consistency is nice, but you can make it firmer of smoother depending on your cat's needs. 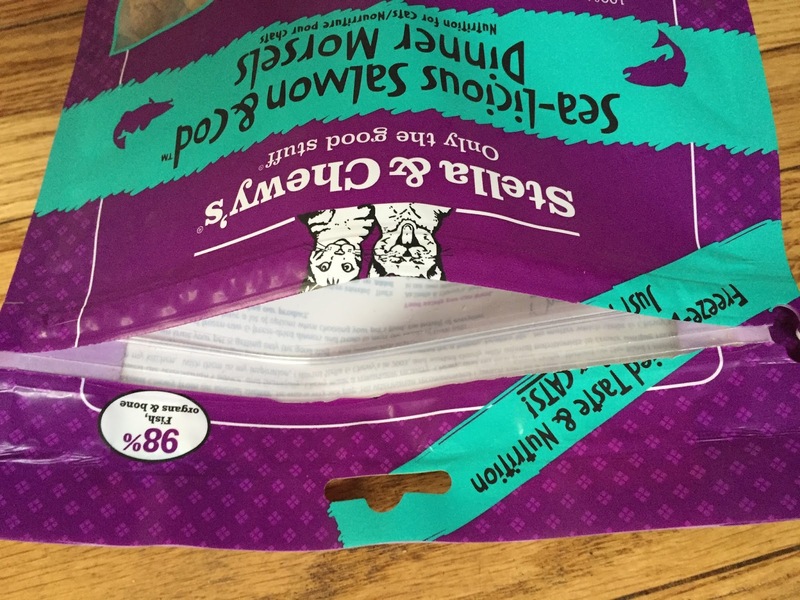 We also like that the pouch sealed easily for storage, but didn't find the "easy open" very easy. Made in America, in Stella and Chewy's own kitchen. Freeze-dried foods are always a little pricey, so you have to expect that. It's just how it is. The 3.5 ounce bag of Stella and Chewy's Sea-licious, Grain-Free, Freeze-Dried food is currently $9.49 at chewy.com. 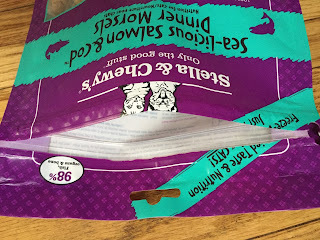 KitCat loves freeze-dried foods, and Stella and Chewy's Sea-licious is no different. This food was a success and earns four paws up from our resident feline!